Hide 466 comments... Click to show. I'm looking forward to buy that card too.I asked Advance he said it will be resotcked,you'll have to wait a bit.Hope that won't take long. Are you coming back? I'm new btw, I probably wasn't here when you were active :). Congrats on getting fifth place in the Strange Love contest! Hey, you can repost them, but be fast! as when you go to the winning screenshots, you'll see some captions in red, they're the winners! Not trying to be rude or anything, but it seems as if your captions for the "Holiday Hustle" contest are a lot similar to mine in just different context. Mind creating new ideas please? Thanks! My bad. I thought you were taking ideas. Sorry! Good luck. Do you play on EU or US? You purchased 40,000 GP. Do you play Cross Fire North America? Merry Christmas and good luck in all the contests you are participating. Cheers! I haven't seen you on in awhile. That was like a sneak-attack to win! Congratulations! HeY mate could you fan me plss need fans!!
] Yeh but the writing itself doesn't take long, it's only when I design my own pictures..
giving it a go on the weekly again buddy? Good luck! Wow. You think my guides aren't good? You seriously need to learn a little respect. I put at least 1-2 hours into EACH guide! ohoho derp got real eh? Hohohoho 2nd place baby yeaa! Yes.. the system has changed now. I don't know why you shouldn't be allowed to participate mate. I wish you all the luck in the world! Hey, just to keep you reminded, I am a admin. And also, no. We won't do this since it is not only about posting the guides and such but it is also about the activity on FanUp. If you want to be a winner you will have to be active. You don't have to be a 24/7 guide writer. You shouldn't be affraid of spammers etc. since they will never win. If somebody is very active they deserve to win. Thanks! also did you just earn those 1k from comments and such? Nah you crazy maniac guide freak (In a good way). BTW admins decided to let apprentice and journeyman guardians to take part in contests :D I'm so happy tto take part again!!! You are getting again the hang of the guides writing! :D I'm sure that you will vdo better this week!! Congratz on the 3rd place! :D 500 FANBUCKS! Darn, too bad i cant compete with ya D: . Anyway good luck and Welcome Back ! Gratulations for the 3thd place and for the Master Guide Smith badge! You need to get the master smith guide badge for put screenschoots or pictures on your guide, U can also upload your picture on the hosting website and post the link on your guide (but nobody will see this picture they needs first to click on the link) Also I hope that I have answered you.. Good fun by posting guides! Hey can u Fan me ?? I will fan you back ..
Well, "Dota 2" isn't free to play, is it? If it is not then we will not add it to our website, since we are only here for the F2P games. Hey silent, I just want to say, don't get upset you are such a good member! And you should really get back on the weekly mate!!! Don't give away the wins that easy!! And get your first place back on the lifetime first place! If you need help with anyhting just contact me man I will always support you! Hey dude? How are you? How's life? Miss ya man! Tell me EVERYTHING! The boss is back! :D Welcome back mate! nice dude u have so much fancoins, btw how much u got as fanbuck? remember that if you make the guides yourself you'll get way more fancoins man! You can earn 1500FC with one guide if you make it ultimate! I can not approve guides, sorry! didn't receive anything, be sure to mail to fanuprochelle@hotmail.com thanks. yea and i know i was on like 8th place... Maybe admins made me 3rd cause they forgot to approve my guides in time or sumthing like that.. i dunno. Feel free to ask me any questions at fanuprochelle@hotmail.com and about your comment, Gamerz defenitly had more FanCoins, if not send me a proof screenshot to my email and I will fix it. Also keep in mind that edited screenshots will defenitly have bad results for you. about Efanges It also is seperate from weekly but you also get your fancoins for the weekly from it :) and it is totally fair since everybody can do efanges. view http://www.fanup.com/efangelist for more information. Hey Bro,Just watching Alexandria on the news,Hope Everything is ok where you are? Lol you are really desperate for that costume contest are you? xD Fanned you! meh iz all gewd i guess , wat aboot u? Also if you could post it under the correct section (Jaxs page). Once you do that let me know and ill delete the old one. cmon man , get that first place . . .
i wanted to reply to your comment but Pressed delete :( Reply:Hahahaha my powers are too awsome for you to beat!! :D,try all you want you will make it harder for yourself! nice guides,i dont know if im going to run for first or not,its just that im ahead and everything. since school is coming close i won't be on a lot so i can't participate in weekly leaderboards until school is over because i won't have enough time , have fun everyone , i will be on from time to time to watch how everyone is doing. Did you receive the FanBucks from the weekly leaderboard thing yet? hey how u redeem points for ijji coins ? yah i might go for it,what about you? Congrats on 1st place bro! Hey Broski, would you tone down on the quick replies that kinda look like spam cause their short and unthought out. Also remember the new rule. It applies to everyone. Thanks man. :) Hey what you up to? I migh. :) Thanks man! nice u came frist wat did u win? :p true but how she get all of those? How did you Get That Much coins? That's the problem, I can't play War Rock in where I live. I'm stuck with AVA. Got any other game suggestions? Haha i don't know if you look cool or not, just different :D Haha jk you look cool! I don't know man.. I just think it's like such a waste of time compared to War Rock. ye ikr lol , looks cool eh? WOW dude you changed so much! Haha! How can it be the best? Seems like a pretty old game, both the graphics and gameplay. holy crap ! why is it getting harder and harder to win weekly leaderboard ? i remember when it was just 2 people really trying hard and on sunday night i would just get into 3rd place . how did you earn that many coins in such a small time? Hey i like the idea of an items guide thanks for the idea! I checked him out, he hasn't been spamming. His content is pretty legit, also considering he puts full out answers in what he posts. Welcome back! MAn..srsly..u have 28k coins..sure that u have already win some bucks..so..cant u let win someone who never win os some newbie?? lol u gonna win again xD? bta3rif elmasri that was killed in lebanon?a 1 year ago? Bro where are ya? Havent talked to you for like 2 days! silent you can earn up to 500 FanCoins per strat/tip depending on how well done it is. ahlan,ita egptian?,ana lebnani do you know araby? Tell me when you reply k? I sent you a messeage bro! Check your mail! Congrats on the third place! no i just wanted to see if i can get second place in 5 hours lol it worked!!!! Hey bro! Could you give me your mail adress or something? Got something to say! sre you like havin a prob? yo i have now clue watch ya talkin about? crap, whoops. Meant to type and hit enter a bit too early. It was going to be a bad joke anyways. My names in that thread under question section of LoL. And im in North America..
look like ur going to win,got any tips for me? ...Nah, it's not a challenge. The lag happens from time to time. Yes the sword is for mods only. Can you please not post your thoughts as a answer to questions? Their a comment box for a reason. dude! how'd you get 2000 coins in just like 5hrs?! Crazy! i just won 1000 fanbucks (legit) and everything is out of stock Q_Q.You know when they re-stock it? He had a few guides that had to get reviewed. They got reviewed they had great content and he got coins = profit!! hey silent, why you did get down at the rankings? Hey, thanks for the suggestion. What's your AVA in game name?. We will be sending new moderator guidelines out shortly. Glad to see you chomping at the bit! maybe and maybe not , why u so scared meng? Are you interested in becoming a moderator/guardian? No promises, but it may be an option for you. Send a note to moderator@fanup.com if you are interested. silent... you think i could have 2nd place this week? yea fraid not lol hater gona hate. hah no it said hometown so i thought that he was from there but moved somewhere . ya know? woah dude . you live in egypt?!? thats Crazy! hes catching up to you too . woah woah woah . im not in 3rrd now because of a spammer? Lol you fell for that trick of his. Can you check when it is lagging do you see a msg at bottom of browser "reading googleadservices"
Silent stop catcthing up to me. Hey Silent, i sent you an email please respond when you get the chance. i might start asking questions out of curiosity. silent y you post the most stupidest questions on ava ? hey silent how do you get so many coins fast? i didnt get fanbucks yet did u? and i need GC too. yo silent warroir... howd you get so many coins that fast ??? 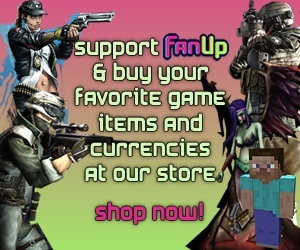 on front page of fanup it says groupon at maonty but i dont see groupon, do u? did they removed groupon offers?